MyCarTracks is a mobile–based tracking service where an app is installed to driver phones or tablets (similar to sports trackers). It’s not working as a standard hardware GPS units that must be hidden vehicles. The app then turns the phone into the tracking unit, it detects when the vehicle is moving and records all the movements. With our fleet setup tool, it’s really easy to set up the fleet or add new drivers with vehicles into the service. You can use Account IDs that you just provide to any driver, he installs the app and enters this code and everything is ready, he doesn’t have to do anything else. All tracked data like GPS position and mileage data or IoT sensor data are sent using your existing GSM data plan (e.g. 3G, 4G/LTE) or Wi-Fi to www.mycartracks.com where they are securely stored. With the Web App console on www.mycartracks.com, you can view all your tracked data in an easy-to-use way, generate reports for tax, payment or billing purposes, analyze and improve fleet performance and manage your fleet with the job dispatch. The mobile device is collecting GPS position and other mileage related data. 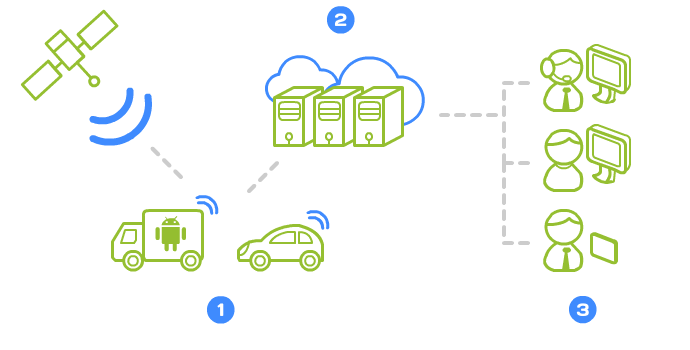 All recorded data are sent as packet data (Wi-Fi, GSM, etc) from the mobile device to MyCarTracks cloud where they are securely stored. Our unique algorithms are partially processing data on your mobile device and therefore the overall mobile data consumption is only 1MB per 1000 – 3000 km (621 – 1864) of trip recording. This makes the real-time localization also faster than with a traditional unit. You can access your data through PC, tablet or phone at www.mycartracks.com. Look at MyCarTracks real usage examples to learn more about how our service can be used.